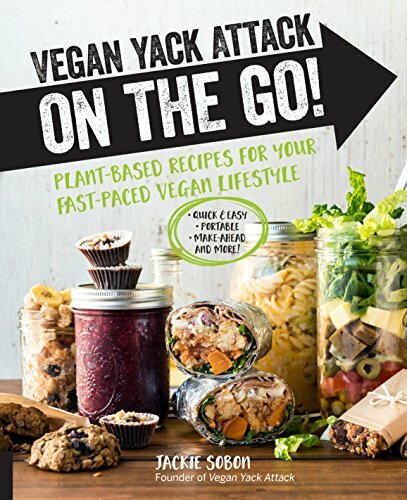 Vegan Yack Attack On the Go by Jackie Sobon is filled to the brim with plant-based recipes for those of you who need to maintain your vegan lifestyle but are also in a rush! There are no shortcuts here -- only wholesome, beautiful, and delicious meals that are approachable and perfectly timed . . .
Where do I start with this book? It is positively GORGEOUS, for starters. Every page is filled with vibrant and inspiring imagery paired alongside some of the most mouth-wateringly creative dishes I've ever seen. Whether you're a strict vegan, or simply wanting to incorporate more plant-based dishes in your diet -- you'll be more than pleased with what you find here. And the best part? Despite their classy appearances, every recipe is easy to create and perfect for those time-crunched days. Why not take a peek inside . . .
And those Lentil Balls with Zesty Rice? Ohmygosh. SO good. You just have to give it a spin for yourself . . .
Gluten-free, vegan, soy-free, oil-free, and sugar-free Lentil Balls with Zesty Rice reprinted with permission from Jackie Sobon of Vegan Yack Attack. TO MAKE THE LENTIL BALLS: Preheat the oven to 375ºF (190ºC, or gas mark 5), and line a baking sheet with parchment paper or a silicone baking mat.Place the lentils, walnuts, dried mushrooms, tomato paste, parsley, salt, and pepper into a food processor equipped with an S-blade. Pulse the mixture until it is broken down into smaller pieces, but is not yet a paste. Fold the bread crumbs into the lentil mixture until combined.Form twenty 2-tablespoon-sized (30 g) lentil balls with your hands, and place them on the baking sheet. Bake for 10 minutes, then flip them over, baking for an additional 10 minutes. Cool on a rack for 7 to 10 minutes before removing them.TO MAKE THE ZESTY RICE: In a pot, bring the water and rice to a boil over medium heat. Cover with a lid, and adjust the heat to medium-low. Simmer for 20 minutes, or until the rice is tender. Stir the lemon juice, parsley, lemon zest, and salt into the rice until evenly combined. Taste and add more salt, if preferred.TO ASSEMBLE: Combine lettuce, tomatoes, and red onions in a bowl, then divide it between 4 plates or containers. Then, divide the rice and lentil balls between each plate. 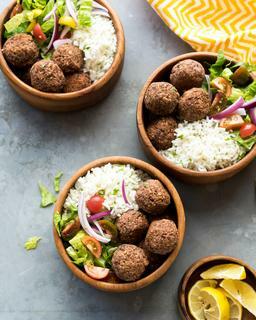 Garnish with a lemon wedge and serve.Tip: The lentil balls can be made in bulk in advance, then frozen for later use!Sometimes bean balls are served with a sauce, but I love this lighter version with zesty rice and salad. The lemon brightens the dish from what is usually a rich recipe. Going light makes this dish versatile, and something that can be enjoyed in warmer months! Vegan Yack Attack on the Go! : Plant-Based Recipes for Your Fast-Paced Vegan Lifestyle - Quick & Easy - Portable - Make-Ahead - And More!